Kristi’s dessert project continues: Dip dip dip. Chocolate chocolate chocolate. My search for great dessert places continues! I’m looking for local restaurants that have great dessert menus serve them all evening long. Most restaurants offer some kind of dessert, but I’m usually disappointed. I play this game when I go to nice restaurnats around town, I like to guess the dessert menu before it arrives. Here’s what’s usually on it: sorbet (often served in a trio), panna cotta, bread pudding, and some kind of fruit crisp or cobbler. While those are all fine, they don’t really satisfy that indulgent desire to really pig out. I want Dessert with a capital “d”. So this week I went to check out the dessert selection at Urban Fondue. The restaurant isn’t open late enough for me, so we went to bar instead. Bartini serves a limited fondue menu, but it includes cheese and chocolate. This was a pretty good little dessert. We ordered the chocolate and peanut butter pot. It was creamy and rich, perfectly heated we were all very happy. 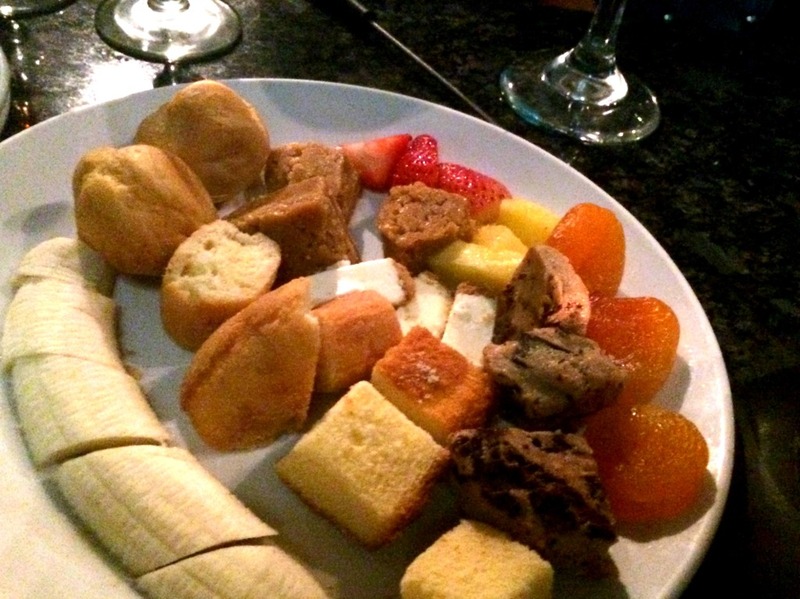 Every dessert fondue is served with a plate of fun things to dip: donuts, pound cake, chocolate chip cookie dough, peanut butter cookie dough, cheese cake, pineapple, strawberries, banana and dried apricots. The fondue is $13 a pot. If you are hungry it will be perfect for 2 people to share, but we split it 5 ways and it went over pretty well. Everyone got half a dozen or more dips. We also had some FANTASTIC cheese fondue. Urban Fondue takes reservations through Open Table, but if you want to go later, Bartini right next door will hook you up. Now I’m off to plot my next dessert adventure.